Early this month, my Perouda Kancil's stock aircond compressor reached it lifetime. So I send it to the aircond service centre and he give me quotation for RM400 by using 2nd hand Daihatsu Mira L2s aircond compressor from chop-shop (halfcut). So i decide to install the compressor by my own to save labour cost and then send to workshop for refilling the gases. So I go straight to the chop-shop and find one unit of compressor Daihatsu Mira L2s for RM170 with one week warranty. The next day, I start my project. 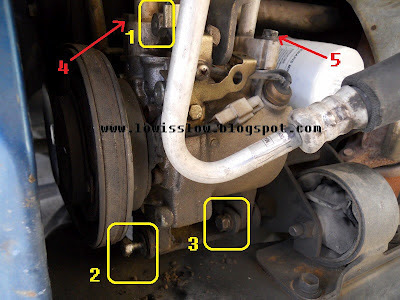 Here, I will share with you step-by-step on how replacing aircond compressor by your own. 3. Spannar/ring no.12 for loosing/tightening the aircond compressor nut. 4. Wire tape; in case any wire need to be cut and reconect. First, remove the front bumper. After that you will see the compressor just next to the oil filter. Before removing any screw from the compressor, you must vent pressurised gases in the pipeline by pressing the valve slowly using philip screw drivers. To avoid direct contact with the gases, cover the valve with rags. Avoid contact with skin and eyes. Make sure no more gases left inside. 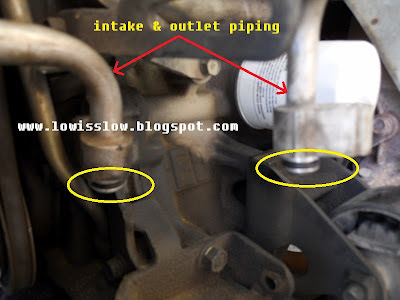 Then you can start loosening screw of the intake and outlet pipe (No.4 & 5 picture below). remove carefully and place it higher somewhere on top of the compressor to allow more space for you to remove the compressor. Next step, remove the connecting wire and the nut on top (No.1) that also function as belt tensioner. At this time you can remove the belt from the compressor pulley. After that, remove the 2 nuts below (No.2 & 3) the compressor before you can take out faulty compressor and replaced with the 2nd hand/new one. Check inside the faulty compressor if there is a debris or black oil. Screw nut below (No.2 & 3 above) the compressor first, and then on the top. Do not tighten the screw on the top first because you need to put back the belt into the pulley. When the belt tension enough, then you can tighten it. How to tension-up the belt? You can do this by pulling compressor by using wooden stick or iron rod from the top of the engine bay, then tighten the screw (you need someone to do this). Then test the tension of the belt by pushing the belt down, the best belt tension will be half inches drop when pushed. ﻿After that, put back inlet and outlet aluminium piping to its position. Remember to change the O-ring (refer picture above), it can be easily removed by using testpen or just cut it using cutter. Do not apply high force to the inlet/outlet screw because aluminium cannot stand for that. Finish that, plug back the wire connecter and put back the bumper. Finally, go to the aircond service center to fill the gases and compressor oil. For this, the boss charged me RM60. 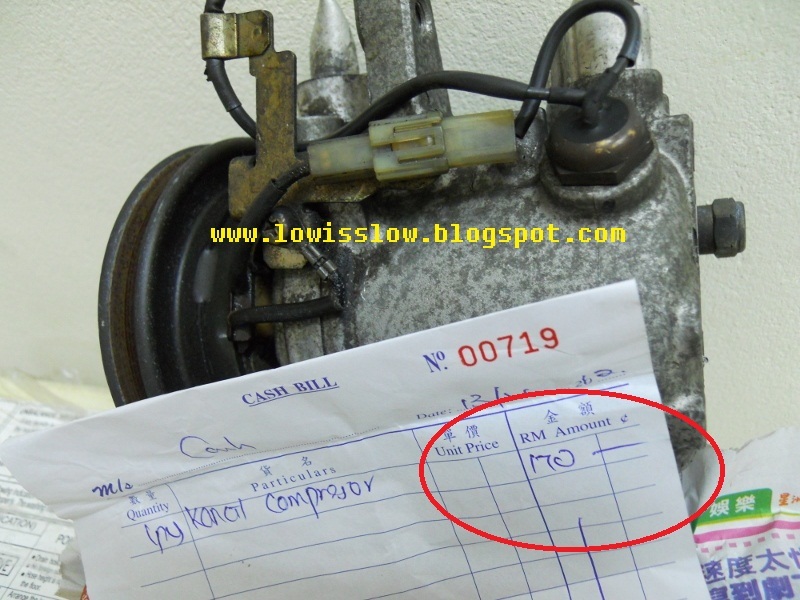 So the total amount for my aircond problem is RM230, instead of RM400; the quotation given by the same workshop. So I save up my money RM170..
﻿﻿﻿﻿﻿﻿﻿ If you buy a new compressor for RM350 + RM60 for gases and compressor lubricant, total is RM410. Usually aircond service center will charge you around RM550-650 for that. You save up RM140-240.00. Forgot to tell you that, I buy O-ring from the same workshop for RM3.00 each, 2pcs = RM6.00. Other place mabye cheaper than this. Very worth for money izzit, so Do-It-Yourself !!! 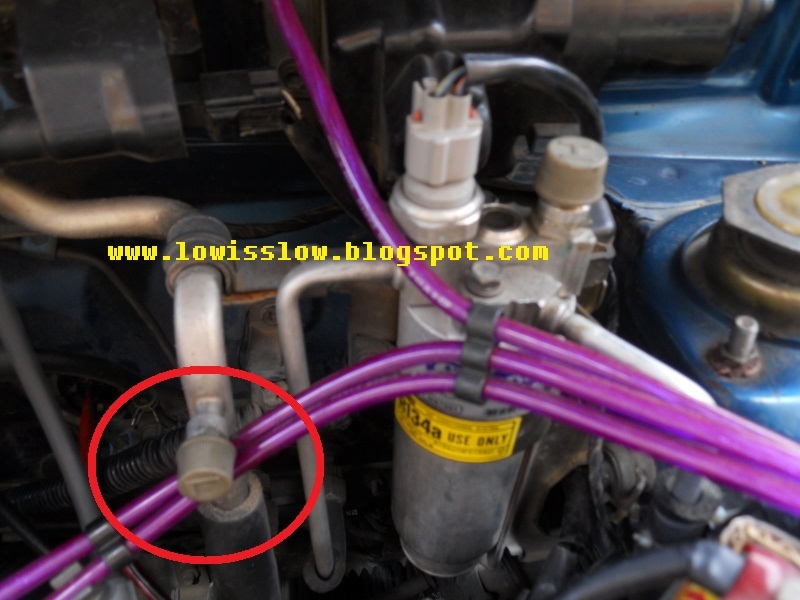 If you plan to change both belting (alternator and aircond compressor), better to do it together with this project. Save time and energy. If you see any debris or black oil inside the faulty compressor, the whole system need to be cleaned. The debris and dirt oil could be has spread into the whole pipe line. The drier (filter) need to change to new one, and the valve (somewhere on the cooling coil under dashboard) must be vacuumed. On this part, I suggest better to ask an expert to do it. Look at the lubricant, if white or yellowish it is in good condition. If you can pull the center pulley by hand (the center pulley will not spin faster as the outer pulley), it is good. Spin the center pulley as fast as you can, you will hear sucking sound from one of the piping hole. It is in good condition. But never expect 2nd hand item as perfect as a new item. If budget permits, buy the new compressor for longer lifetime. There is lead inside of old bulletts and in some pellets they make these days. very good info , thanks a lot i will try to DIY since i got second hand kancil 660 for free last month. not very sure bro..usually they (halfcut shop) will say; if not functioning, return it asap.. Thanks for sharing this replacing Aircond Compressor system. It's very useful post for me. good to read this article, this is especially informative for me. If you are looking tools for best air compressor for good efficiency of your machine you can give a visit in our websites. at aircompressormartguru.com , Right here, you get expert air compressor reviews which can help you purchase the best air compressor . Bill, you hit the nail on its head with the tips for buying 2nd hand compressor. Interesting read. Location is incredibly vital once selecting a mechanical device. this is often the primary issue to think about and can confirm what form of compressor you wish. If you're about to add an interior space with the mechanical device, we have a tendency to suggest an electrical supercharged unit with an occasional noise rating. The noise rating is measured in sound unit and therefore the lower the quantity, the lower the noise. Compressors recently area unit rather more quiet than older models, and a few operate at levels as low as sixty sound unit. At this level you'd be able to have a standard speech communication, standing next to that. Gas supercharged compressors don't seem to be suggested to be used in capsulate areas with no ventilation. What's the total amount of oil need for this compressor? do you put the oil on your own or take it to the shop? Is this compressor large enough to be used with an impact wrench? Good articles!!! what is best stainless steel cookware ? After a long time I have found such a detailed with picture presentation. Thanks for sharing.